Do you want to be a key part in our wildfire detection program by spotting forest fires? Do you have what it takes physically and mentally to withstand working long hours in isolated conditions? If so, a Lookout Observer position may be an ideal seasonal position for you. A Lookout Observer's first priority is to provide early detection and accurate reporting of potential forest fires. Lookouts provide continuous observation until fire control personnel arrive at the fire location. There are 127 fire lookouts located throughout the province. Directly related experience considered on the basis of: one year of experience for one year of education. A lookout observer must have excellent eyesight, with or without vision aids, particularly at long distances. The ability to see colours and have good depth perception is critical to distinguish the slight differences and shadings of various types against hazy backgrounds. Any vision aids (glasses, contacts) should be from a current eye doctor prescription. Only highly self-motivated individuals can overcome the loneliness and often monotonous routines associated with the lookout observers' way of life. Observers must also be self-reliant, able to learn quickly and work without supervision. A lookout observer is required to perform a variety of duties. However, the first priority is to provide early detection and accurate reporting of all potential smoke and fire within the lookout visible area. Continuous observation on the progress and behaviour of the smoke or fire until fire control personnel arrive at the fire location is also required. Maintain a constant vigilance for smokes indicating wildfire and communicate reports and check-ins by radio with the Forest Area office at scheduled times. Record and report all unauthorized smoke or smokes by radio to the area. Record and report all observed lightning storms and strikes to the area. Monitor authorized fires which are under permit. Maintain a Fire Permit Register and update as new permit locations are received and old permits expire. Check and record weather readings at least twice daily and report to the Forest Area Headquarters. During an ongoing fire, recording and reporting weather on an hourly basis. Act as a communications relay between fire camps, field staff, aircraft, etc., as required. Maintain a station log of all radio transmissions. Perform routine maintenance work on the lookout buildings, equipment and to the site itself. Maintain the buildings and facilities in a neat, clean, and orderly manner at all times. What are my chances of getting a job as a Lookout Observer? There are 127 fire lookout positions available. In any given year, 15 - 30 positions become open simply because a lookout in good standing is given the option to return the following year. The best time to apply is November or December so that your application is on hand and can be referred to. How long is the work day? Time spent observing for smokes depend on the weather and fire danger. If it is raining, very little time is required. If it is hot and dry and a lightning storm is predicated, then much more time making observations is required with 12 hour days being the norm. There is no overtime, however, there will be a high hazard day modifier paid when extreme burning conditions exist. Each Forest Area is responsible for lookout training. The training can be either a structured event at a central location, on the job with an experienced lookout observer providing hands on instruction and explanation of policy and procedures, or a combination of both. What is provided at the lookout site? There is a small propane refrigerator, stove and heater. The propane is provided. There is an engine house where the power plant is located and an outhouse. 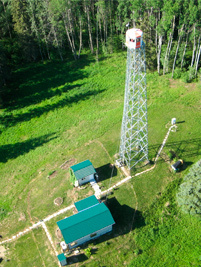 The lookout tower itself may be 6 m (20 ft.) to 30 m (100 ft.) in height or a cabin type with access through a hole in the ceiling. The average tower height is 30 m (100 ft.). You are responsible to insure that the house and related facilities are kept in a neat and clean condition at all times. As well, most sites have a small shed for miscellaneous storage. There is no running water. Rain water is collected in barrels and boiled for washing. Bathing/shower facilities are usually the result of individual ingenuity. Groceries are not provided. Drinking water is provided. Can I bring a spouse, companion, children, or friend? Yes, however you must advise the Forest Area Office well in advance of any intention of having others stay with you. The Forest Area is under no obligation to transport other family members, friends, etc. to a remote lookout site. If you intend to have family with you, road accessible lookouts are the obvious choice. For families staying at the lookout site, every precaution must be taken to insure that children do not wander off and become lost or involved in potentially dangerous situations with wildlife, poisonous plants, etc. It is imperative that an individual on the ground is watching the children and not the lookout person in the cupola. It goes without saying that all persons staying at the site should be in good medical/dental health. If the lookout is a fly-in, the animal must be of reasonable size and in a cage. The pilot has the right to refuse to carry an animal which is aggressive or uncontrollable. At the lookout site, it is imperative that dogs are tied, locked up, or otherwise controlled whenever a helicopter or airplane is landing or taking off. It is your responsibility to keep the grounds and facilities clean and free of animal wastes. Groceries are ordered from a list of common food items. You are responsible for making arrangements with the local merchant regarding method of payment, etc. prior to departure for the lookout. At remote sites, groceries are delivered once a month. What can I bring in the way of hobby supplies and personal interest items? Moderation is the key. Personal interests must not conflict with the primary function of early detection of smoke/fires. What if I have a wedding, family reunions, etc. to attend during the summer? You must advise your supervisor well in advance of any requests for planned time off; preferably at the time of hire. Every attempt will be made to accommodate your request; however, during periods of high hazard or during active firefighting operations, all leave may be cancelled or transportation may simply be unavailable. It goes without saying that the lookout is a poor place to become sick for anything other than a cold or other minor ailment. Lookout observers should be in good general health and a recent medical checkup and a trip to the dentist is required. If the illness is serious, you will be removed from the lookout by the quickest means available and taken to the nearest medical facility for treatment. What is the Policy on Drugs and Alcohol? Should you require medication and/or prescription drugs, you must ensure you have an adequate supply on hand. Use and/or abuse or non-prescription drugs in the workplace, as well as excessive consumption of alcohol, will not be tolerated and may result in discipline if founded.